Within digitize.textfiles.com there’s a chipper little sales catalog for a line of fruit-themed power connectors. Really! The name of the company was Electronic Protection Devices, Inc. They produced power cables, power splitters, and power monitors during the early 1980s. 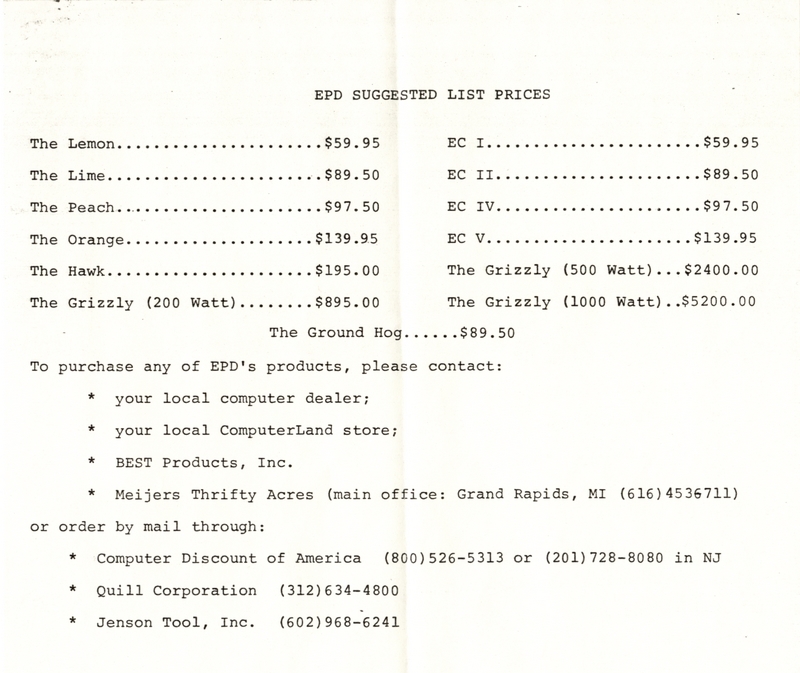 As part of my endless writing away for catalogs and “more information” from computer magazines, I got a hold of their 1983 mailing and put it up for the benefit of the world. 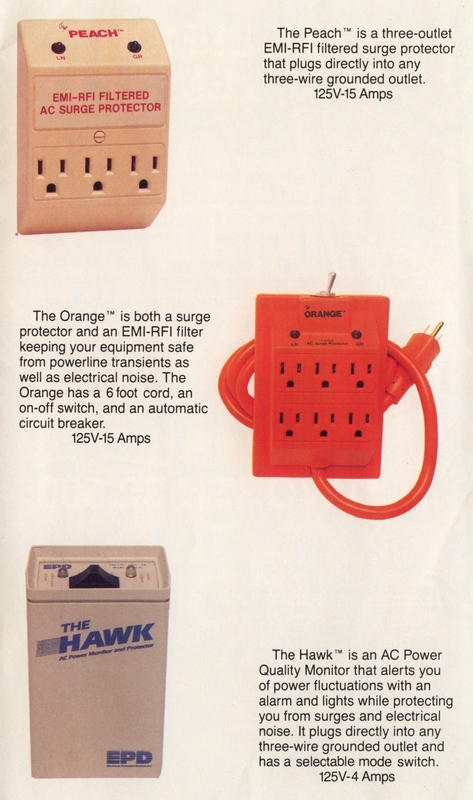 It’s the fruit theme that makes this collection of power equipment stand out: The “Lemon” (a six-outlet surge protector), the “Lime” (the “Lemon” with a switch and a 6-foot power cord), the “Peach” (a three-outlet version of The “Lemon” with EMI-RFI filtering), and the “Orange” (a six outlet verson of the ‘Peach”. Of the 12 pages of the catalog (not counting separate price list), roughly seven of them would fall under the now-well-known advertising approach of “Fear, Uncertainty and Doubt”. You’re warned of the terrifying fluctuating electric world we live in, where surges and spikes snack upon your precious hardware like a plague of locusts. Nobody is safe; lightning appears across a page, forks of death driving themselves into the roast beef of your power grid. Only the well-researched, top-quality EPD protection line of surge protectors will save you! 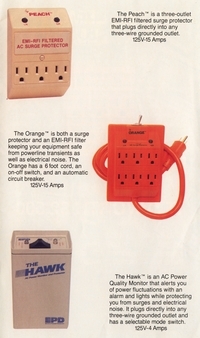 There were two other items available, the “Grizzly” (a UPS) and the “Hawk” (a power line monitor with alarm! ), but since they’re not fruit-themed, I assume this was the result of some internal naming battle where the marketing guru said “It’s just not going to reassure them if we call it ‘The Watermelon'”. As the fruit liberates, so shall it imprison. And how much did this collection of power nirvana cost you? Quite a bit, comparatively. 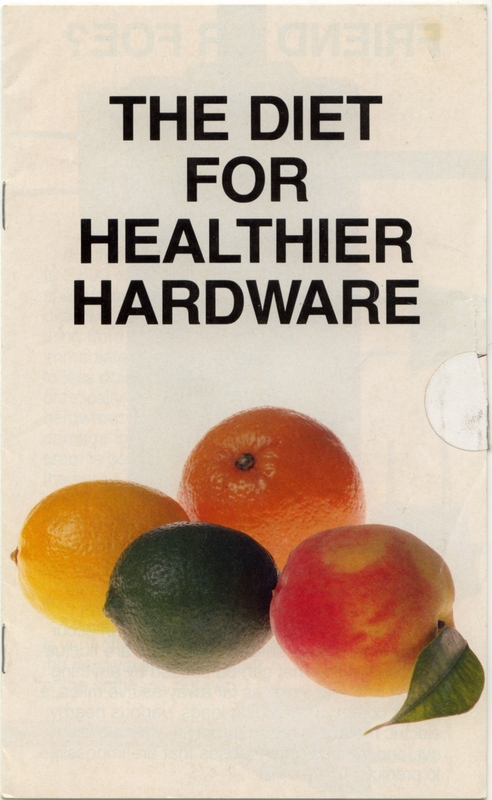 The least expensive item, The Lemon, would set you back $60. “The Grizzly” started out at $895 for the 200 Watt version and skyrocketed up to $5200 for the 1000 Watt version! I’ll bet you could hear a little cheer raise up at 5 Central Avenue when one of those showed up on the order queue. Since 5 Central Avenue in Waltham is near where I live, I drove by and took a look. Electronic Protection Devices is long gone, no indication left that there was anything like that inhabiting that building. It’s just another non-descript structure in a forest of them, buildings designed to house stuff inside but not impress the passer-by. The fact that the address was listed as a PO Box indicates a mail forwarding company, or possibly an advertising tracking method (although it would be silly to use a P.O. Box instead of a “Department”). I’ll go with mail forwarding, although the building was big enough to house the manufacturing arm if they had so chosen. I’ve always had a fascination with the cruel contrast between how a company appears inside my head and how the actual company looks in real life. Both myself and many others have made “pilgrimages” to these firms only to get quite the shock. Maybe it’s a kid thing; you want to go to the magical land where things come from, but there are not that many true magical lands. 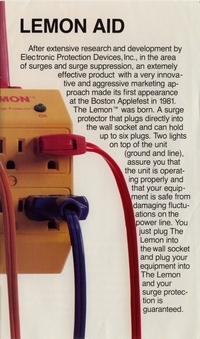 Naturally, a dedicated power supply company would have scant chance of living through the outsourcing of the technology sector to the point of the $5 surge protectors we see today; even the UPS market has optimized to such a degree that you can buy one with a USB connector, many more plugs and an ability to tell the computers hooked to it to start shutting down. For whatever time they had, EPD’s days were always numbered. It looks like they started life in 1981, and I find evidence they got at least up to 1993 before expiring. Interestingly, it looks like they ran a 1-800 BBS for a number of years for technical support. After further research, I find messages in 1996 begging for assistance in finding EPD’s current location to get a “Grizzy” replaced. So for at least a dozen years, this fruit basket stayed ripe, even though like all things it ultimately went sour. I’m not really sure that’s fair in this case — in my mind, this place looks like a Skittles factory with the Fruit of the Loom guys working on the assembly line.